Photography And Text By Richard (subscriber contributor) © All rights reserved. Creating your own bird bath with running water will be a rewarding experience... especially when your bird bath attracts some beautiful birds. Water is a very important element in a bird's life and the water that you offer the birds will be welcomed indeed. You need a mould to pour concrete in to form the actual bath. I used a car tire but any other suitable shape can be used (Figure 1). 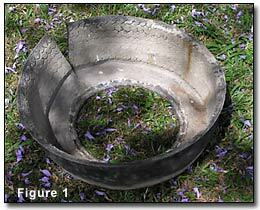 A flat circular piece of sheet iron was used to cover the hole in the tire but this may not be needed if your mould already has a bottom (Figure 2). 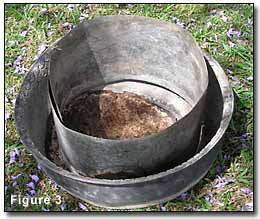 Next, I rolled a piece of sheet iron into a circle and riveted it to form the inside of the bird bath mould (Figure3). 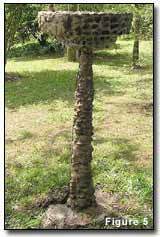 A 1 inch (5 foot long) galvanized iron pipe was used for the shaft. I poured a concrete footing into the ground placing a short off cut of oiled pipe into the center of the footing to form a hole for placing the shaft into later. The same hole was created to the bottom of the bath so that it can fit onto the shaft (Figure 4). I cemented flat river stones (mosaic style) onto the upside down bath. Once the stones set, I turned the bath over and cemented the stone to the rim. The pipe was placed into the footing and the bath was placed onto the top of the pipe. 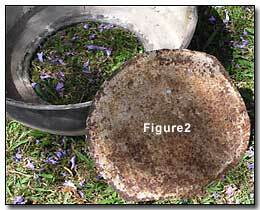 (Figure 5) Cement was placed around the shaft (thicker at base, tapering off towards the top.) As you cement, place stones on the shaft (a little Bondcrete or something similar will help the stones stick to the cement). I ran a thin poly irrigation line underground from the tap with a timer up the shaft into the bath. Each day as I head off to work I just turn the timer on for about 10 minutes. Enjoy your bird bath.